This is starting to be a habit! 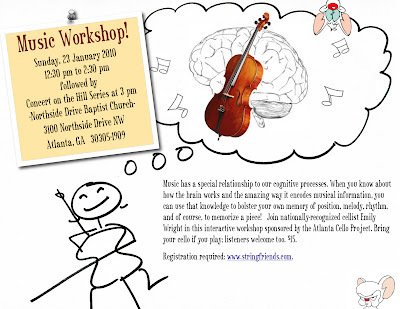 For the third year running, I’m being hosted by Ann and the Atlanta Cello Project. This time around, I’ll be talking about memorization, offering tips, and passing along some handy information about short, long-term, and working memory that I’ve been studying over at Hopkins. While the entire emerging field of cognitive neuroscience is (rightly) looked at with skeptical eyes, much of what I’ve studied thus far is plain old neuroscience. This part of the brain does that. Look at what happens when the brain experiences trauma or other degeneration. Here’s how long it takes the structure of the neural networks to adapt to new constraints. As someone who has taken special interest in students with brain degeneration and injury, this has helped shape my assumptions about learning in these special cases. What we know about injured brains also informs knowledge of standard brain science. Most of it confirms my already extant intuition: every person is different, but the whole “can’t learn as we age” thing is a load of hooey unlike any other. The brain is, above all, resilient. There are things we can do to maximize our practice time and make memorization less of a terrifying prospect. That’s what we’ll be talking about on January 23rd. Of course, there will be time for Q and A, and I already have 4 people signed up for private lessons in the days before: I bet I have room for 3 or 4 more. 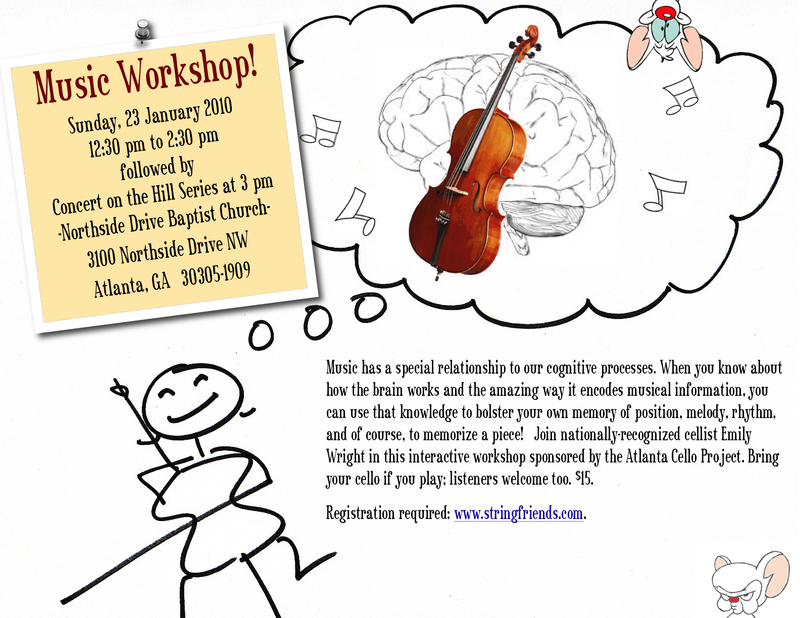 Click to enlarge the very silly flyer. Ann made me do it this way! NextThe how and what of good practice.